I have been doing several things all at once, which made things more hectic than usual. 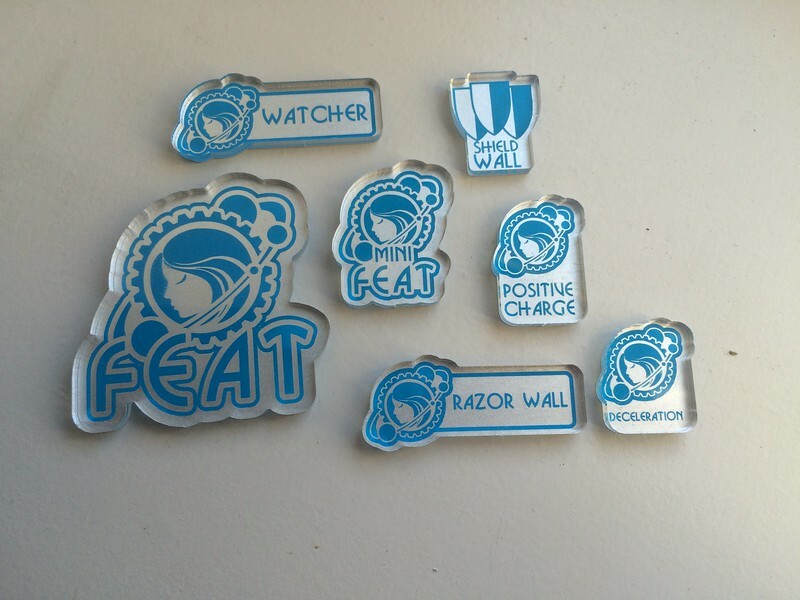 One of the sponsors was Frozen Forge, and they sold their merchandise at the event. I may have gone on a shopping spree due to this fact. I even got my hands on a limited edition set of the Convergence tokens. They are super nice. After Clogcon the urge to play and tinker with lists received a boost because we always want to improve on our experiences after big events. And I wanted to be ready for the next event(s). Looking forward the bigger event on the horizon is the Provincial Championship in Belgium. The core idea is to have a WTC style team tournament where a team from each province (Belgium has 10) competes against the others. Building experience in this format outside the actual WTC, means players who would attend for the first time do so with some experience in the format and should lead to better results in the future. After talking over lists / match-ups / combinations /… with the other players in my meta, we formed a rough idea of who takes which faction and what direction we wanted to take in list building. One of the changes we decided on was my faction, as having 2 Khador players on the team didn’t really make much sense (to us). 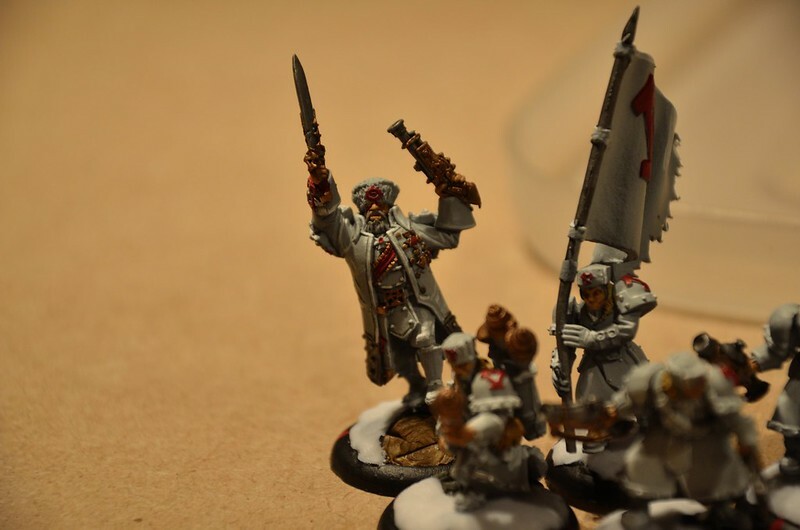 And since I’m still starting out with the faction and our other Khador player has been playing the faction for ages, it was an obvious choice. Looking at factors such as which faction provided me with the best results over time and how we could keep things rather simple for myself, we landed on me making my return to Convergence. After seeing some amazing battles involving a German Convergence player at Clogcon I have to admit I wanted to revisit the faction at some point in the near future. I have pretty much every model the faction holds twice so list building doesn’t have limitations. And I was unhappy leaving a part of the faction unpainted / unassembled, so this was a good reason to correct those little past mistakes. In order to start painting my Convergence again, I needed to clear the stuff that occupied my painting desk first. So I finished my Winterguard death star first. Meanwhile I ordered some new bases from Model Display products, so i could have more options when basing my various armies in the future. I also wanted to get some 120mm options. 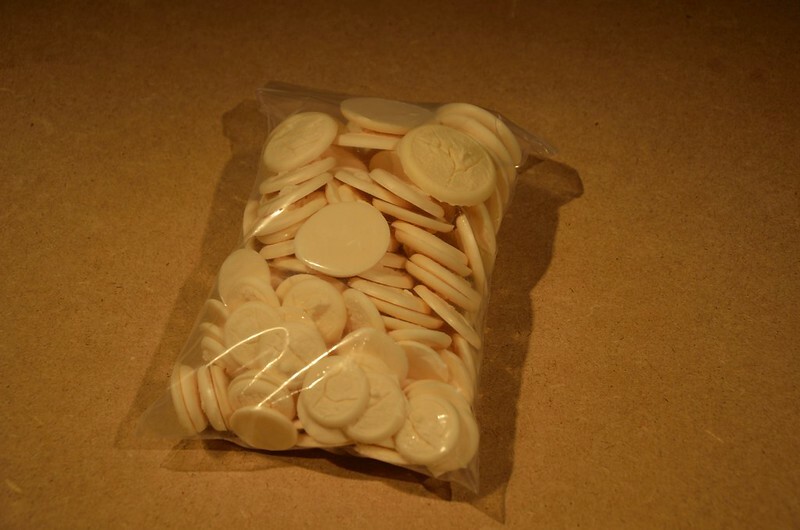 For the 120’s I ordered 4 different types. The forest type since I wanted to complete that set (it’s the one I had been using for my Khador). The Regal stone was also an auto include as I was using this base type for both Ret and COC in the past and I had used 2 of the 120’s before but never got to making a mold of it first. Then I ordered 2 complete sets (30/40/50/120) of Industrial rubble and Block paving. Sadly the Block paving set doesn’t have a 120 mm variant. 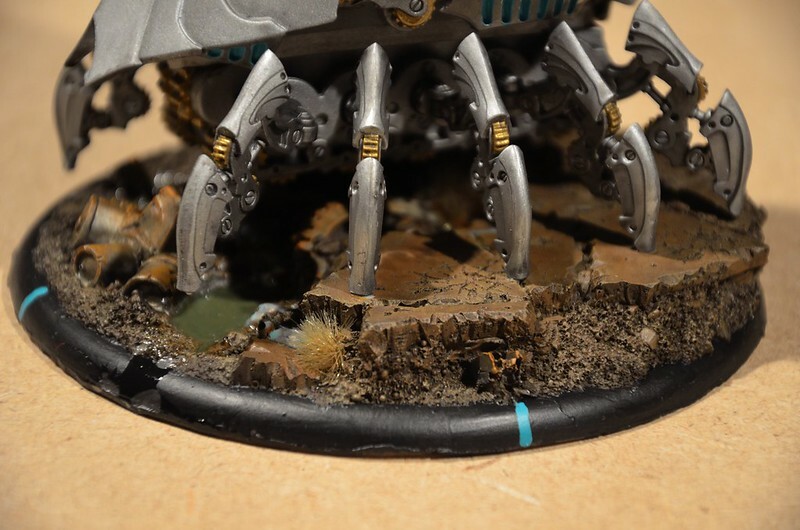 The last base was a 120mm of the Rocky Terrain, it’s a pretty basic hill base which makes it perfect for multiple settings. Depending on how you dress it up it could be made into Desert / snow or even all green and lush. Most of these have been molded by now so I can reproduce the bases when I need them for new models. A buddy of mine is planning to paint up a Skorne army and he liked the bases I was using for mine, so he asked me if I wanted to make some bases for his models. It took me a good week to get them all prepped but it was fun to see how fast I could produce a large amount. 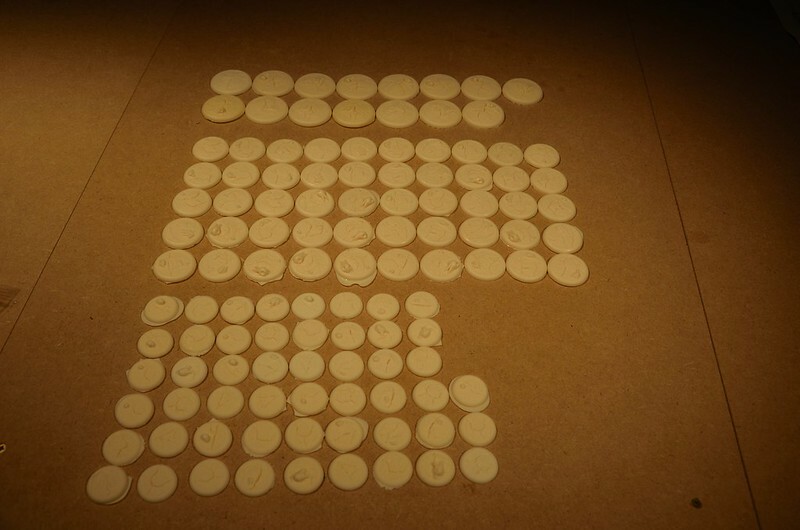 I only cast bases when I actually need them so I had no idea how fast I could churn out larger numbers. 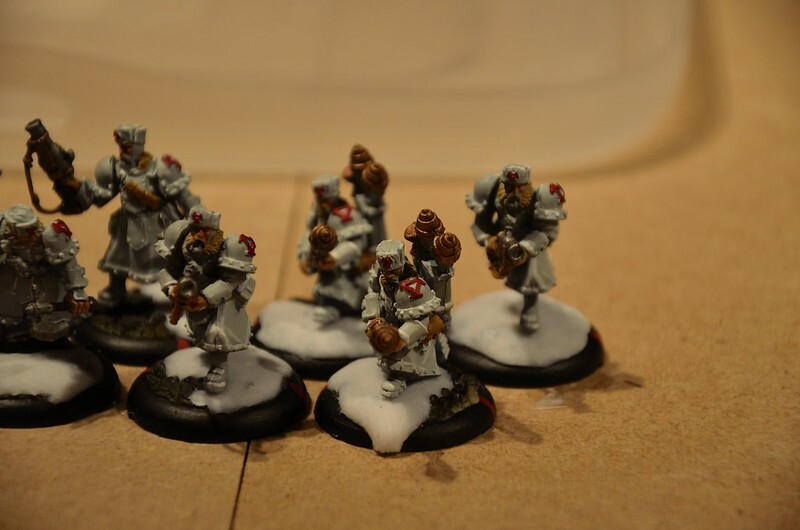 Now while casting the bases took me some time, I ofc didn’t really sit next to them, watching them harden out, I painted. I pretty much shattered any previous speed records I may have set in the past by finishing 2 Tep’s in less than 1 week. I started cleaning the parts on Tuesday and they were all finished on the table on Saturday. I also used one of the new bases I had acquired for them, the 120mm Industrial Rubble. It’s a really nice base with nice variation and depth. The fact that there’s this little puddle makes it complete as it easily lends itself to water effects. On one base it worked like a charm, on the other one it took in some air and the effect didn’t apply as I hoped. I’m contemplating on leaving is or redoing it, right now I’m focused on finishing other models first. The servitors are all painted up but I had to wait to be able to put them on some of those new bases. My 2 Lists are the Axis tier list and a Lucant list that contains the 2 Tep’s and an Axiom. 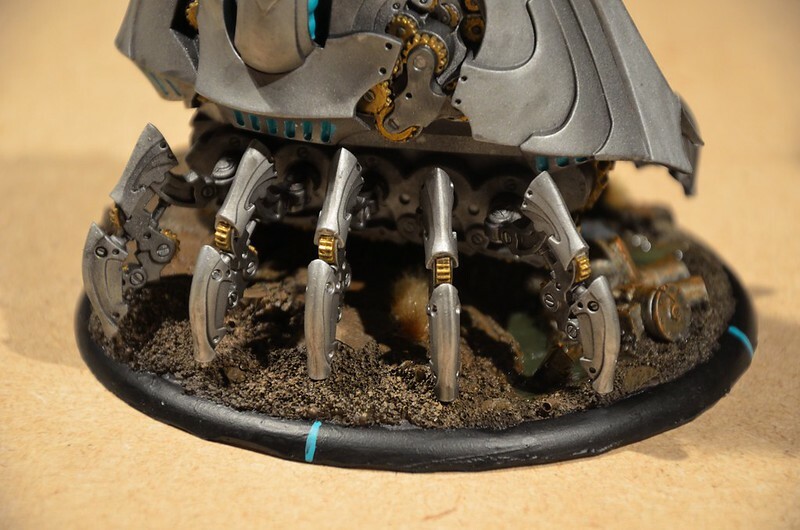 For the Lucant list all that remains is to put the Tep’s servitors on their bases (which should be finished this week). The Axis list will take some more work still. 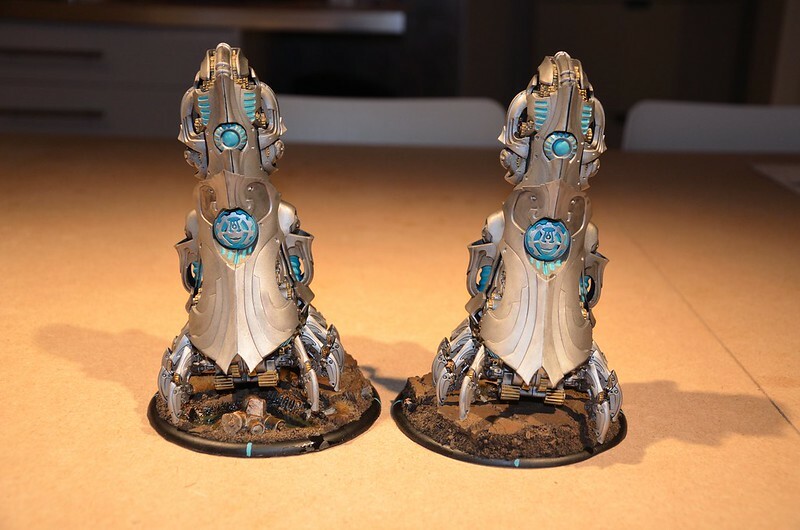 I painted up 2 units of Angels and they are just like the Servitors awaiting their bases. I’m also finishing up the arms for the Conservator. I magnetized them when I magnetized my 3 kits but since Axis wasn’t a thing back then, the Conservator wasn’t either and I never painted up those arms. Which means I now have 4 arms to finish. 2 are done, 2 more are just primed and waiting for some attention. After all this I still have one unit of Obstructers, one unit of Reductors and 2 Enigma Foundries to go. 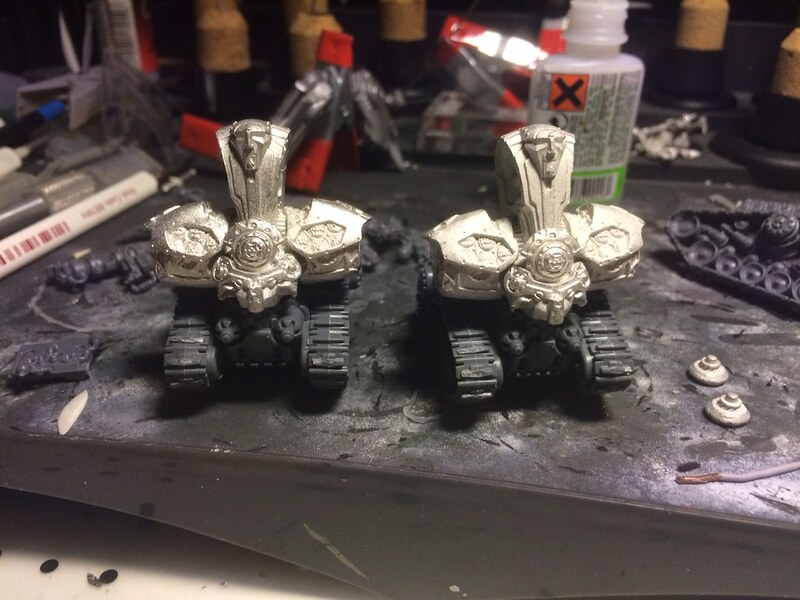 The foundries are already base coated in steel color, so they can be finished rather fast. I’ll be working on their bases first alongside the 12 others I need to do for the servitors and angels. 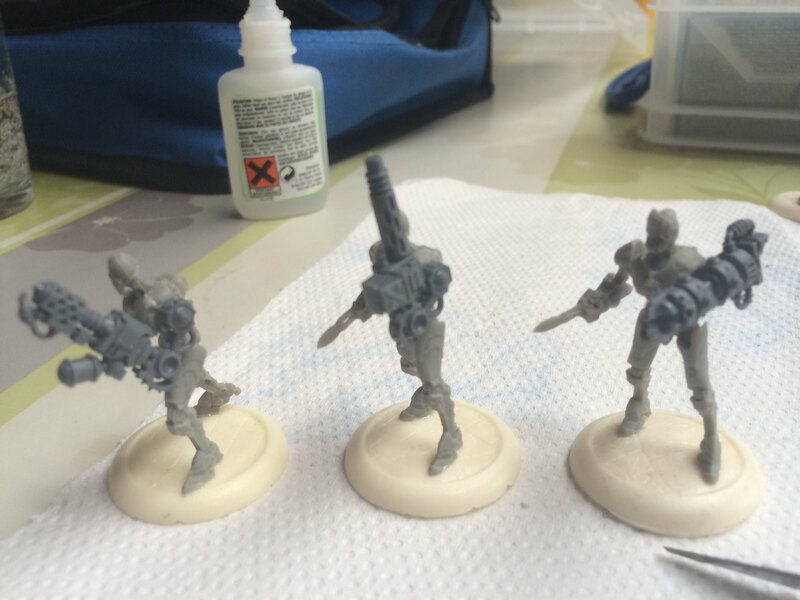 The Reductors were an experiment, they are bright Yellow and have guns for arms instead of arms with guns on them. The Yellow tones are done, I just need to do the highlights on those and then the other colors, which will take some time as it’s detail work and the models aren’t the easiest ones to work with. The 2 Foundries are also a little modding project as having four identical ones seemed rather boring. Once the above models are done I’ll have to figure out what to do with the Obstructors. I really like the idea of making the units looks all special like the Yellow Reductors. It makes them stand out without looking out of place really. 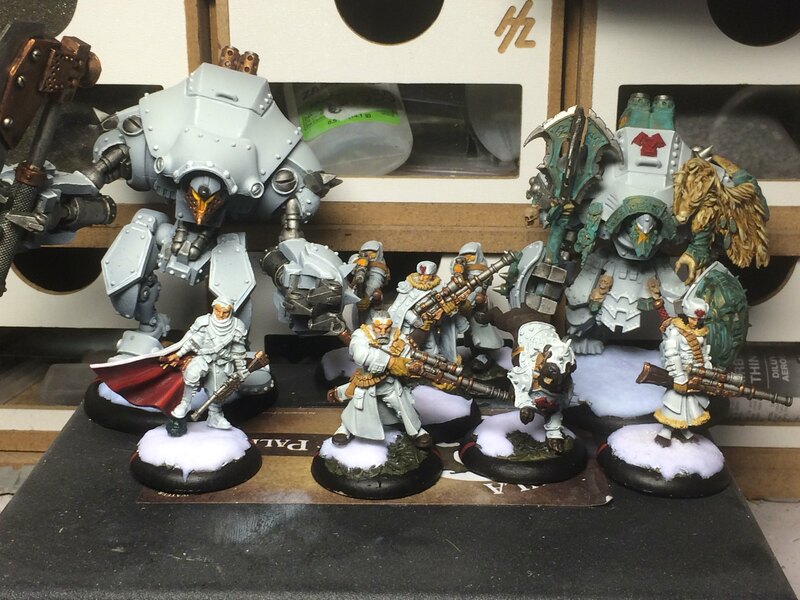 Having 4-5 units on the table with the same metallic color on them just creates a massive blob from which even I would have trouble determining which models is part of which unit. And honestly I don’t want that. The plan at this time is to make my 2 remaining units of Obstructor both Unique as well by giving them each a unique scheme. At this point a green and a red tone come to mind, maybe even a blue tone, nothing is set in stone however. Well, I’m off to finish what’s on my painting table and I hope I can post more soon. In the last few weeks a few things have changed/ improved on the airbrush front and as a result I have some more finished models to share. About 3 weeks ago, I was having a hard time because I required an airbrush to finish the gray tones on my models and I couldn’t paint the other parts before this step was completed. The way things stood at that point regarding Badger and warranty it felt like I wasn’t going to get a new airbrush, which made me rather unhappy. I turned to the net (facebook groups /twitter) to share my story, and received more feedback than I had expected to be honest. People shared their own bad experiences and gave tips on which brands / models of airbrush were known to be more reliable and such. After reading the responses I decided to go for the sure thing and i ordered a new airbrush, an Iwata HP-C. I haven’t had any regret about it since. Great airbrush, great performance and easier to clean / maintain that the badger I had. This is positive, as it means they have kept to their claim of replacing broken airbrushes, and it means that if I ever have an issue with my Iwata, I have a spare. The day I received my Iwata, I started using it instantly, which has resulted in a small painting marathon. The goal was to have as much as possible ready by Clogcon, which is this weekend. The Ret experience part 1: list building and testing. 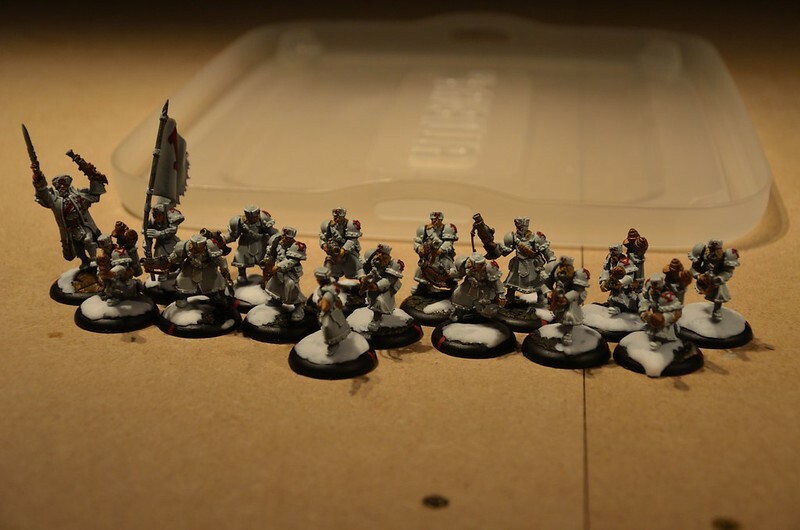 Painting Retribution Part 5: Invictors & Halbs.